I finally found a great free app for the Mac that will capture a whole web page from Safari. I’ve been trying to find a free app, but haven’t found one I liked. The app is called Skitch and I’ve actually been using for a while now. I just discovered the web page capture function today by accident. The commandto capture a web page from Safari is Snap Safari under the Capture menu item. I’ve use a Firefox plugin called Pixlr Grabber for work, but it crashes so much. Every time I release final files for a HTML emails, I need to send along a screenshot of the whole page and the Mac’s built in screenshot only captures a portion of the screen. I think Skitch will help me out a lot. 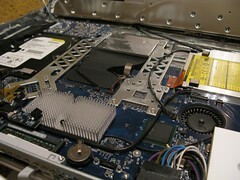 I have a spare 500GB SATA hard drive that I’m not using, so I decided to replace the 250GB internal hard drive. I bought the 500GB hard drive a while back to try to fix my old Mac mini, but I never got it to work again, so I gave up. 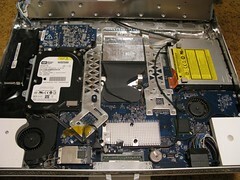 First step was to get a 2.5″ Hard Drive Enclosure so I can clone my existing MacBook internal hard drive to the new one. I got a cheap Vantec NexStar TX 2.5-Inch SATA to USB 2.0 External Hard Drive Enclosure from Amazon for under $10. Once I got this in the mail. I installed the new 500GB drive into it, plugged it into my MacBook and formatted it. Next, I download the Carbon Copy Cloner app to clone my existing drive onto the new one. After more than 3 hours of copying files over, I shut down the MacBook, opened the back panel and unscrewed the internal hard drive. I then swtiched it with the new drive… powered it on… and it booted up with everything pretty much the same. The only big difference was that I have way more hard drive space. Now, I’ll keep the original hard drive (in the USB hard drive enclosure) for a couple months, just in case something goes wrong with the new drive. I’ve been manually transferring my journal entries from my old blog to this one, but haven’t quite completed the process. As, I was trying out an app called MacJournal, I discovered a slightly easier way to transfer entries from one blog to another than using a web browser (which was hoe I was doing it). I still have to do each entry manually, but I don’t have to copy/paste/enter entry dates/etc. 2. I then created another journal for my current blog (the one you’re reading) following the same steps as above. 3. I then downloaded all the blog entries to MacJournal using Journal > Download Entries from Blog… Now I can see all my entries from my old blog. I just stumbled across a really cool iPhone app called Air Mouse Pro that allows you to use your iPhone as an air mouse, trackpad or remote for your computer. I bought it (for 99¢) and played around with it for a little bit here at work and it seems to work okay. I usedit mostly as a trackpad, since the air mouse mode takes some getting use to.